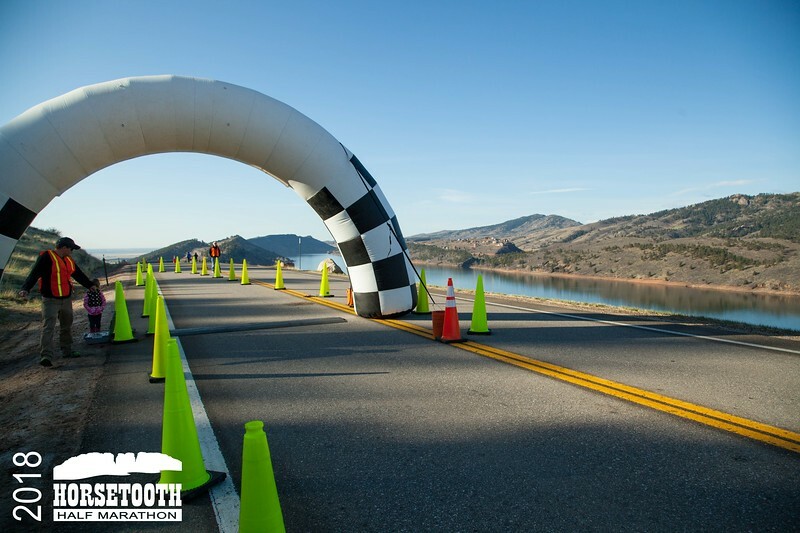 Coming into the Horsetooth Half, I wasn’t sure what to expect. Although part of why I signed up for this race was so I could attend the training runs, where I would experience the course and meet some people (because Connect), I didn’t attend a single group training run and trained on the course only once. Oops. I knew this would be no PR — both the challenging nature of the course and my mediocre fitness would keep that from happening — so I viewed it as a where’s-my-fitness run and planned to give it the best I had on that day. The weather on racc day was downright perfect: sunny and just a little chilly. We arrived at the race around 7:45 for the 8:30 start, and while Jordan parked, I jogged a little, grabbed my bib, and jogged a little more before getting in the porta-john line. Although I made it in and out pretty quickly, the start was delayed a few minutes because of long bathroom lines, but finally, the anthem played, the runners cheered, the countdown began, and we were off! Before I get too far here, I think you need to see the elevation profile, or my recap won’t make much sense. Here it is, courtesy of the race’s web page I have a bad habit of starting every race too fast, and I knew that if I went too hard on those first climbs (and subsequent downhills), I stood a good chance of blowing up and putting myself into a major sufferfest before I was even halfway through. Having trained on the course only once, I wasn’t really sure how to pace myself, so I lined up with the 1:45 pace group. I hoped to be faster than 1:45, but I also hoped they’d keep me reigned in for the first couple of miles, and then I could pick it up later. This strategy had both pros and cons. The pace group did, indeed, keep me from blowing up early (my first two mile splits were 8:50 and 8:57), but I also ended up doing more weaving and passing throughout the race than I would have preferred. I don’t regret starting conservatively, though, since that’s a skill I desperately need to work on. View from the top of Monster Mountain. This photo, and all the photos with the logo in the corner, from Erin Bibeau Photography. I pulled away from the 1:45 group after topping “Monster Mountain” and ran on my own (but in a crowd) for the rest of the race. The course was beautiful: from paralleling Horsetooth Lake to the farms and horse pastures beyond the lake, the views made the miles tick by. Before I knew it, I was up and over the final climb of the course, Bingham HIll, and turning toward downtown. I think this is after Bingham Hill. This is what happens when you wait three weeks to write a recap: you forget things. The final few miles run along the Poudre Trail, and mentally, that’s where the race got hard for me. The trail is flat, and while it weaves through some nice little natural areas, they’re not particularly exciting, and late in the race, my mind starts making excuses for why my legs should slow down. I told my mind to shut up, though: starting conservatively had left my legs with more pep than they usually have late in the race, so I dug in and sped up. I had to hit a porta-john just after mile 10, which was frustrating, but my bladder was making it quite clear that another 3 miles weren’t happening. I made the stop, then picked my pace up again and headed for the finish. One great part of this course was the spectators, and they were in fine form as we made the final turns into downtown Fort Collins toward New Belgium brewery. Cheers and cowbells helped me push through the finish, and I crossed the line in 1:40:04 (darn that bathroom break!). Smiling(ish) as I hit the finish line. Photo cred goes to Jordan for this one. That’s nine minutes slower than my PR, but I’m still satisfied: it was a tough course, I’m far from being in PR shape, and I paced myself well on a course that’s hard to pace, and that’s a win in my book. This year was its 45th in existence, and the experience shows. It’s well organized and well planned. It’s beautiful! There are no ugly spots. Huge prize purse, if you’re super fast. Crowded. Over 2000 people ran this year, which made for more bobbing and weaving than I like. Of course, that’s MY fault for starting too far back. Weather in April can be sketchy. We lucked out this year, but the two days before had been windy (as in, 60 mph gusts) and rainy/snowy. If you sign up, know that April in Colorado is unpredictable. Overall, I highly recommend this race and would certainly do it again… maybe even next year. Who wants to join me? What’s your favorite local race? Post-race beer at 10:30 a.m.: Yay or nay? bobbing and weaving is such hard wor. Great time and race! I was watiing for you to make fun of the damn Dam hill though 🙂 But the monster hill I guess earned its name for you. Haha I thought about punning like that, but then I didn’t. I should’ve. Great job! Looks like a fun race!